We're here today to talk about overdue fines, which can be a surprisingly divisive issue. I've worked in a few different library systems, and every system (heck, every library!) deals with fines differently. In some libraries, having even $0.25 in fines can result in a blocked library card; others will have a cap (one place I worked had the cap at $30, another at only $5), at which point you can no longer borrow items or use online systems. Some places don't have fines at all, which can cause some issues in and of itself (such as, a patron having a book out for months at a time and not feeling the need to return it). Incentive to bring books and other materials back in a timely manner. Raising money for library services (sometimes). It causes unnecessary stress on library patrons and staff. Patrons with very overdue books know they owe money, and won't return to the library because they either don't want to or can't pay the fines, or they're embarrassed about money owed. Okay. So, that's what we have going on. It's not a perfect system, but it works fairly well. BUT - is there a better way? Some libraries have creative ways of dealing with fines. Perhaps one of these could work for you! Amnesty Day/Week/Month - Some libraries will have Amnesty/Forgiveness during certain times of year - usually the first week of summer vacation, or around New Year's. Bring your items back and, no matter how overdue they are, they will be checked in without fines. I used to work in a library that had Fine Free Wednesdays every single week, and let me tell you, it brought in tons of people who hadn't been to the library in far too long - sometimes years! Since it was all checked in fine free, there was no issue with being embarrassed, because we wouldn't even know how overdue the items were. Plus, Wednesdays went from our slowest days, to our busiest! Food for Fines - Often done for a week or sometimes the entire month of December. Patrons bring in food/non-perishable items for the local food pantry or homeless shelter, and we waive any fines that have accrued on their account (or, in some libraries, clear $1 off for every food item). I've also seen this done in partnership with animal shelters, with donations of canned cat and dog food. No Fines for Special Populations - Fines will accrue on items until they are returned, and then they will be waived for whichever people qualify. I've seen this done for senior citizens, children under 12, military service members and veterans, and patrons with special needs. 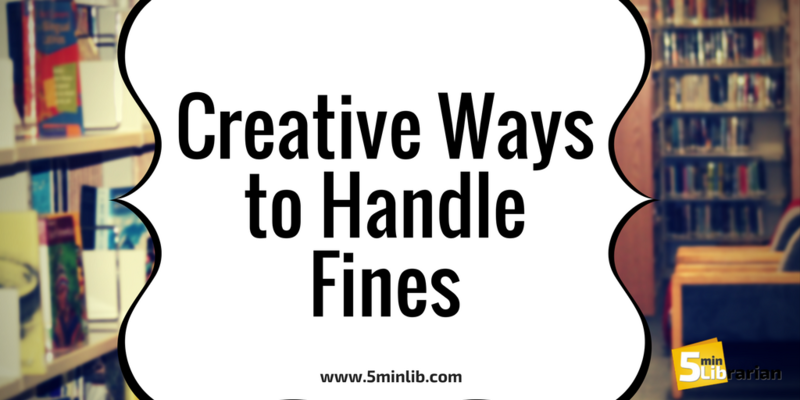 No Fines at All - As above, fines will accrue on patron accounts until materials are returned. This prohibits people from keeping items indefinitely, because if an item reaches "Lost" status or the fine cap, they can no longer use library services until materials are returned - at which point, all fines are forgiven. Fines Waived After a Certain Time - I haven't seen too many libraries do this, but there are some out there in which fines will be cleared after a certain time - generally a few years, so a book that was checked out to a 6 year old will no longer be on their account when they are in high school. Work It Off - Some libraries will take volunteer time in lieu of payment for fines. This can be problematic for libraries, because we prefer our volunteers to make a commitment to keep coming back for a certain amount of time (at least a year), and because they need to be trained before they can work/shelve for us. However, if a teen patron wants to work off fines they accrued by cutting out shapes for storytime crafts, this may be a good work-around. Read It Off - In some libraries, children under 12 can reduce their fines by reading (usually $1 waived per hour read) - but they have to be reading while in the library for it to count. We'd love to hear some ideas that work for your libraries. Please let us know in the comments here, on our Twitter page, or on Facebook.